I can't seem to get an answer on this from any of the stratus forums. Maybe the intrepid 2.7 will be similar enough to give me an answer on this. I just swapped a new used 2.7L into an 05 stratus that had a sludged 2.7L. But like an idiot, I forgot the starter wiring. On the starter, there are 4 different things: 1 spade terminal, 2 posts (for + and -), and another wire on the housing of starter. The problem I'm having: I don't know which one is positive and which is negative. I assumed the wire on the housing of the starter goes to the negative post. That wire is only long enough to reach the closer of the two posts, so I assumed that is the negative. Thus the other is the positive. So I connected the ground wire + wire from the housing of the starter to the closer of the two posts and the positive wire to the battery positive wire. Does this sound right? Here's a picture of the connection. If anyone has a picture of the starter from a 2.7L intrepid, please let me know. That would help a lot! Sweet! Thanks for the vote of confidence. Now if only it would stop raining long enough for me to install everything back. 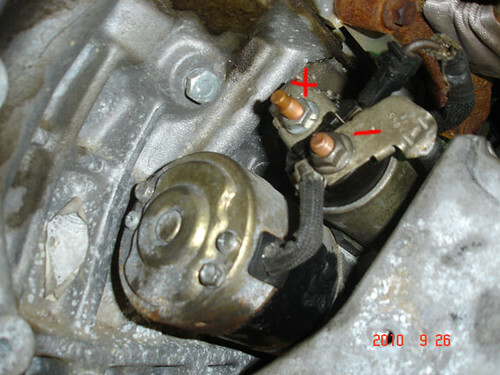 I wired my 2001 Chrysler Sebring Convertible like the picture above, and the new starter I bought started right up. I let the car run for a couple minutes and started smelling electrical fire, when I shut off the car I had a strong smell like an alternator burning out. When I removed the new starter, and disassembled it I found the starter internal wires were burned in half and the armature had a hole burned in it the size of a dime. This is not the way a Chrysler starter is wired. I am guessing the two heavy terminal wires both go on the positive solenoid post, and the post with the wire extending from the solenoid to the starter is only for that. I am installing the second new starter today I hope I have this right.